Following their 2008 release ‘This Present Wasteland’, a competent, but only moderately inspired album, Metal Church broke up. Imagine my surprise when the release of ‘Generation Nothing’ was announced. In fact, the lineup remains unchanged, but ‘Generation Nothing’ is a much better record. Where ‘This Present Wasteland’ did a decent job consolidating Metal Church’s trademark sound, ‘Generation Nothing’ is something of a rebirth on par with – or possibly even better than – the coming of Ronny Munroe in the shape of ‘The Weight Of The World’. 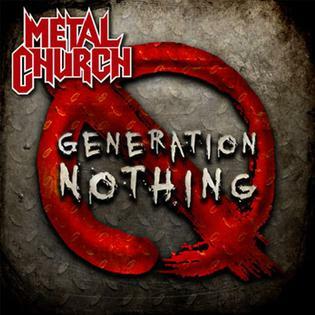 ‘Generation Nothing’ shows the Metal Church we’ve come to know and love over the years. This is strong American Heavy Metal with powerful guitar riffs courtesy of sole remaining original member Kurdt Vanderhoof and lots of room for Munroe’s vocal tour de force. However, something seems to have re-energized Metal Church. ‘Bulletproof’, for instance, is a remarkably fierce kick-off by Metal Church measures and the compositions are generally more interesting and surprising than any of the band’s post-2000 output, contributing to a very pleasant listen. Then again, what may help as well is the great quality of the material. Despite only ‘Noises In The Wall’ being of actual epic proportions, there’s actually quite a few tracks that take their time to grow into a composition with multiple different climaxes. ‘Hits Keep Comin”, the fantastic dark closer ‘The Media Horse’ and ‘Suiciety’ would definitely qualify as epic in that matter. The latter has one of the album’s most impressive guitar solos on the album as well. Along ‘Bulletproof’, ‘Scream’ is surprisingly Thrashy for Metal Church. The relatively melodic chorus does make it a typical Metal Church staple and everything combined, it’s probably the best track on the record. Looking at the individual performances on this record, I once again have to emphasize my weak spot for Ronny Munroe. He stepped into big shoes, following up the legendary David Wayne and the much better Mike Howe, but he does so very well. His vocals are characterized by an enviable amount of power and just the right amount of grit. Nothing here gets as good as his live performance of ‘Gods Of Wrath’, but Munroe is one of the better singers Metal has to offer at the moment. Guitarists Vanderhoof and Rick van Zant – both Dutch names, the nationalist in me would like to address – both do a fantastic job here. ‘Generation Nothing’ is very much a riff record, but their solos are simply awesome, sometimes helped by the fact that the solo sections are notably well-written. Bassist Steve Unger and Savatage drummer Jeff Plate are a formidable rhythm section, with Plate having a warm, authentic sound that seems forbidden on many contemporary Metal productions. While maybe not quite be on par with the almost inhuman brilliance of ‘Blessing In Disguise’, ‘Generation Nothing’ is the best album Metal Chuch has done in a long time. In an era where the only old-school bands are bands tributizing their heroes in a way that it borders on parody, it’s good to hear the real thing delivered with a sincerity and a passion that contemporary Metal begs for. But then again… They’re not a “Metal Church” without reason, right?